Here it is! My first Instant Pot recipe! I am beyond excited. I bought the 8 quart Instant Pot earlier this year with the goal of replacing my slow cooker AND my rice cooker, since the Instant Pot can do everything. And obviously, I was also excited about the idea of quicker dinners without having to stand over the stove. Well, I still haven’t brought myself to get rid of the slow cooker and the rice cooker – I keep telling myself “why get rid of them if I have the storage space?” I hope I don’t turn into a hoarder later in my life. But the slow cooker and rice cooker haven’t been used since I got the Instant Pot. I love using it for quick dinners and side dishes! It lives in my countertop because I use it pretty much daily. I’ve mostly been using the Instant Pot to steam cauliflower and potatoes to make mashed cauliflower and mashed potatoes. And to make huge amounts of rice in very little time. And to make amazing paella (this Shrimp Paella recipe from My Forking Life is SO GOOD!). 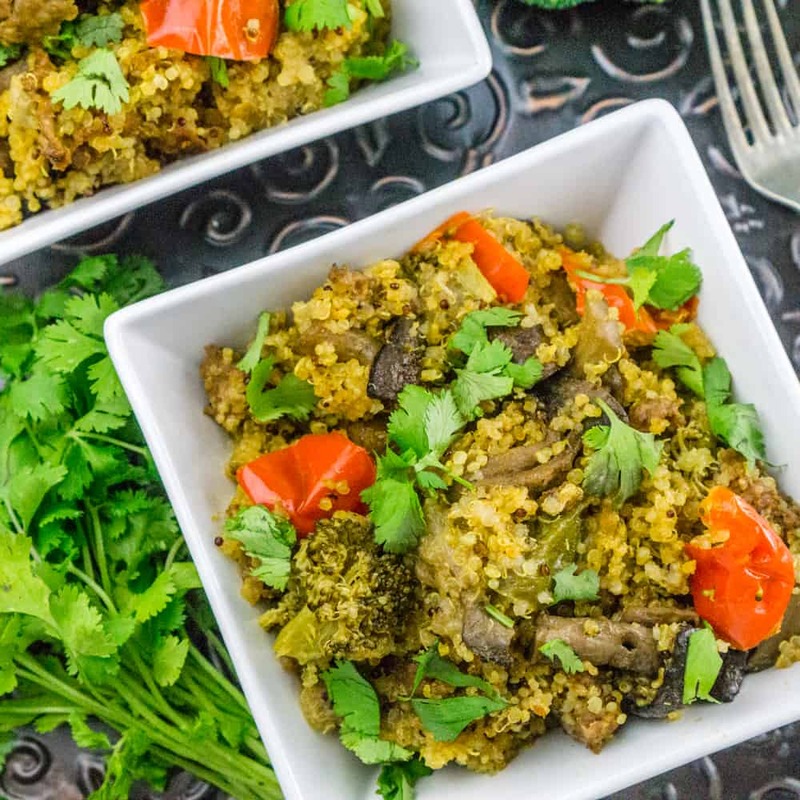 And now I finally felt comfortable enough to create my own recipe – this flavorful, colorful Quinoa with Sausage and Vegetables. Of course, I had some help from the internet and had to refer to other bloggers for instructions on how to cook basic quinoa. This this 1-minute recipe from My Forking Life is brilliant! Yes, 1 minute is all your need to cook quinoa. It’s like freakin’ magic! I have a Master’s degree in Chemistry, and yea I remember PV=nRT from school, but I still do not understand how in the world this is possible. Magic, I tell ya. 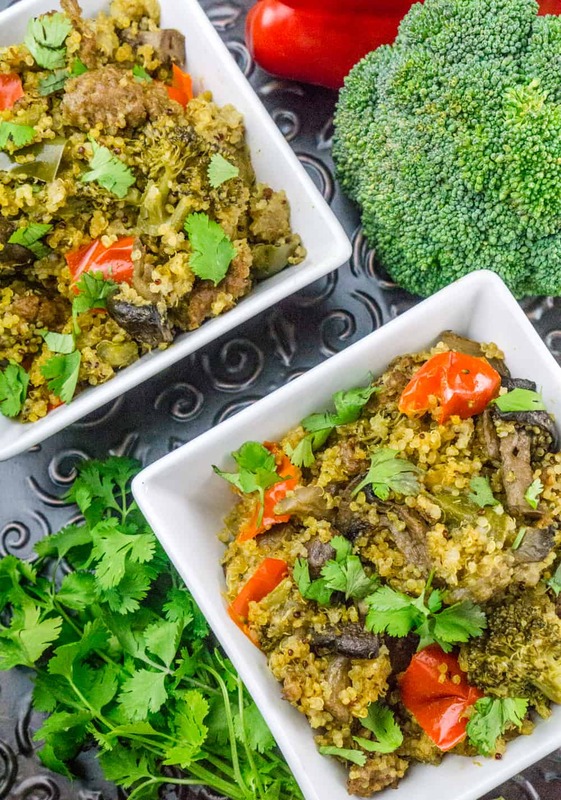 Anyway, this Quinoa with Sausage and Vegetables made in the Instant Pot is super easy and delicious! Aldo is usually not a fan of quinoa – he grew up on rice and thinks it’s the best grain/side dish out there. But anytime there are crumbled bits of sausage involved, he is down for eating quinoa, and lots of it. And it doesn’t hurt that there are a TON of vegetables in this recipe. By the time I chopped all the vegetables and had a huge bowlful of them, I wasn’t sure they were going to fit into the Instant Pot. They did (phew!). I am so glad I went for the 8-quart version of the Instant Pot so I can make enough food to have plenty of leftovers to pack for lunch. 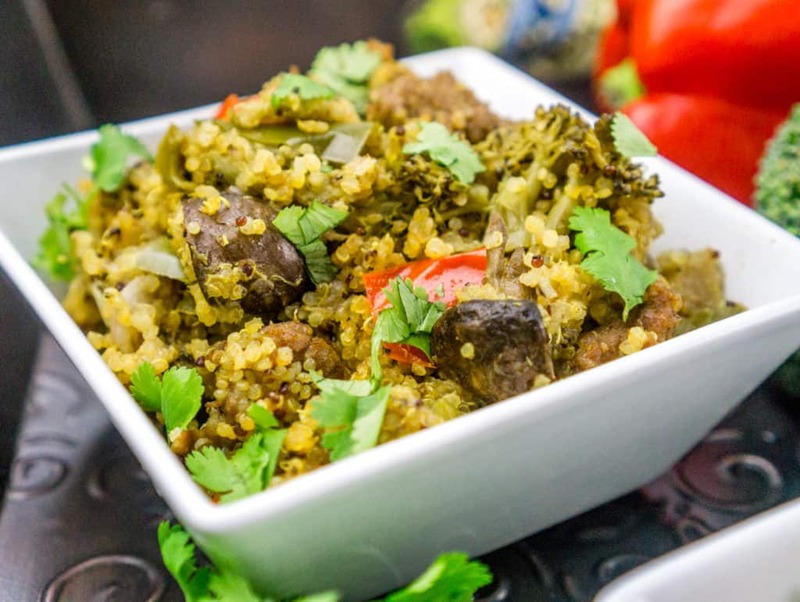 There are a lot of vegetables packed into this dish – it is full of yumminess and nutrition, with minimal work involved…. Especially if you buy the vegetables pre-chopped and save yourself 15 minutes of prep time. 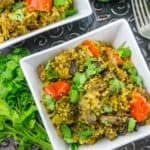 What else will I need to make Instant Pot Quinoa with Sausage and Vegetables? 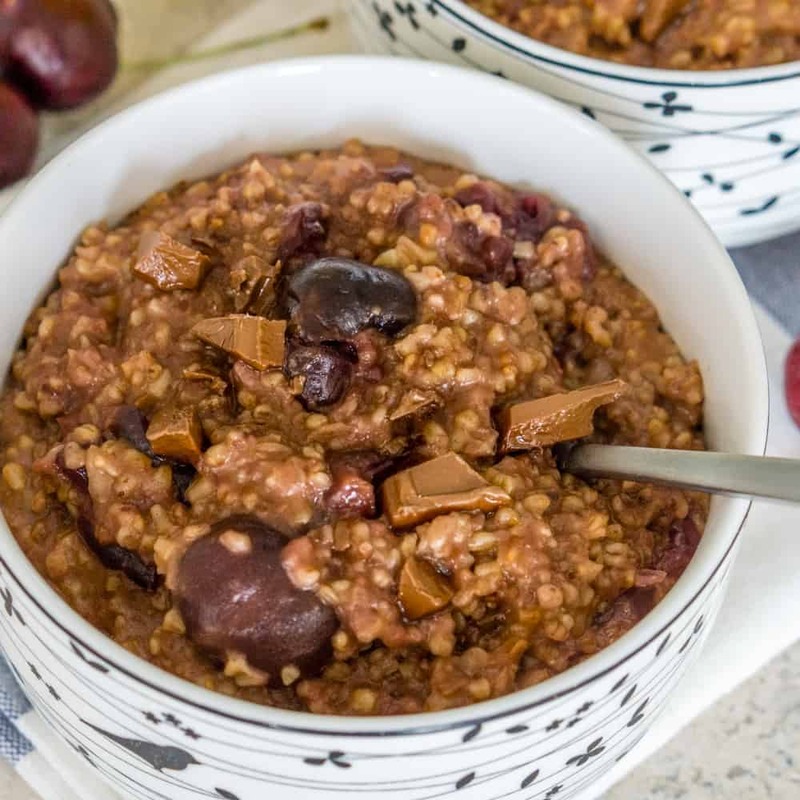 Well, aside from the obvious, such as the Instant Pot and Quinoa, I have a few tricks that make this recipe extra tasty. First, I always cook quinoa in chicken broth or veggie broth, depending on the recipe. This gives quinoa extra flavor as opposed to cooking it in plain water. Just substitute broth instead of water in the same ratio. In this case you only need 2 cups of chicken broth to cook 2 cups of quinoa because the Instant Pot is so efficient. For extra flavor and color, I also add a bit of paprika and ground turmeric. Both of these spices are very subtle but they add so much beautiful color to every dish and they are packed with antioxidants. 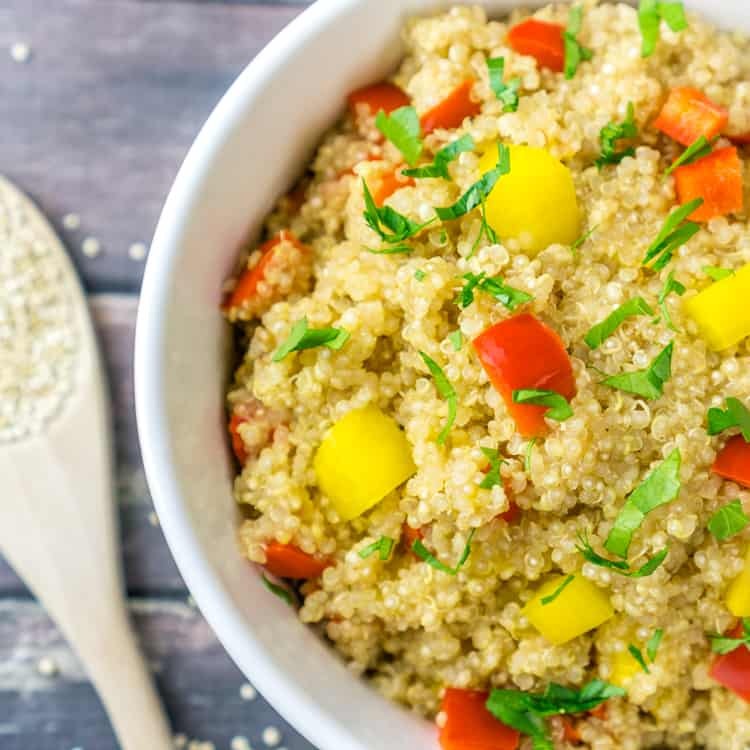 They are the reason the quinoa in this recipe is a lovely golden color. I teamed up with The Spicy Apron to bring you her Instant Pot Video Course. 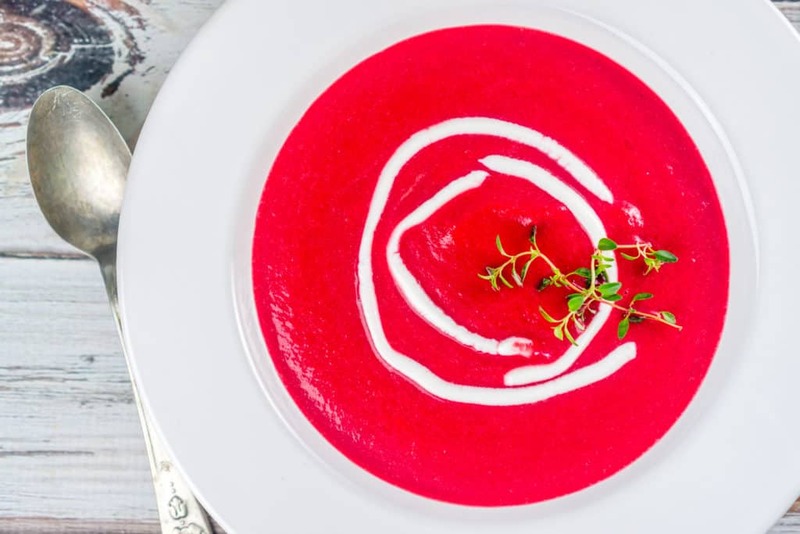 This course has 8 different video modules that walk you through using your Instant Pot for everything from simple to more complex techniques. Side dishes, main courses, desserts, and pot-in-pot techniques that really save you time in the kitchen. Use the code BABAGANOSH5 to get $5 off the course. Get started here. One of the other things I love about the Instant Pot is its saute function, which means you can brown meat in the Instant Pot and not need to get another pan dirty. So for this recipe I start with cooking the crumbled sausage with the chopped onions for a few minutes to brown the sausage and give it extra crispness and delicious flavor. Then I add the rest of the ingredients in, give it a stir, and set it to cook. That’s it. Two easy steps for a delicious well balanced dinner. 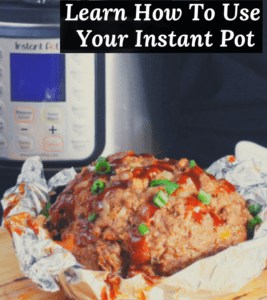 This is my first time writing up a recipe for the Instant Pot, so I hope it is clear for everyone – Instant Pot newbies and pros – to follow. But if anything is not clear, please leave me a comment/question about which step needs to be re-written! I would greatly appreciate it. If you enjoyed this recipe, please leave a star rating and a comment below, and don’t forget to save it on Pinterest for later! Using the saute function on the Instant Pot, heat the vegetable oil. Cook the sausage meat and the diced onion until the sausage is browned and mostly cooked, and the onion has softened. Add the paprika and turmeric powder and stir. Turn off the saute function on the Instant Pot. The sausage will not be fully cooked at this point, this is fine. Add the quinoa and chicken broth, and stir well. Add the rest of the ingredients (all the vegetables) and stir well. Cover the Instant Pot and set to cook on manual on high pressure for 1 minute with the vent set to "sealed." Once the 1 minute is over, turn off/unplug the Instant Pot and allow the pressure to release naturally for 10 minutes, then manually release the rest of the pressure. Fluff with a fork and transfer the quinoa to a serving dish or immediately transfer to another container to cool down. The Instant Pot idea sounds very appealing. 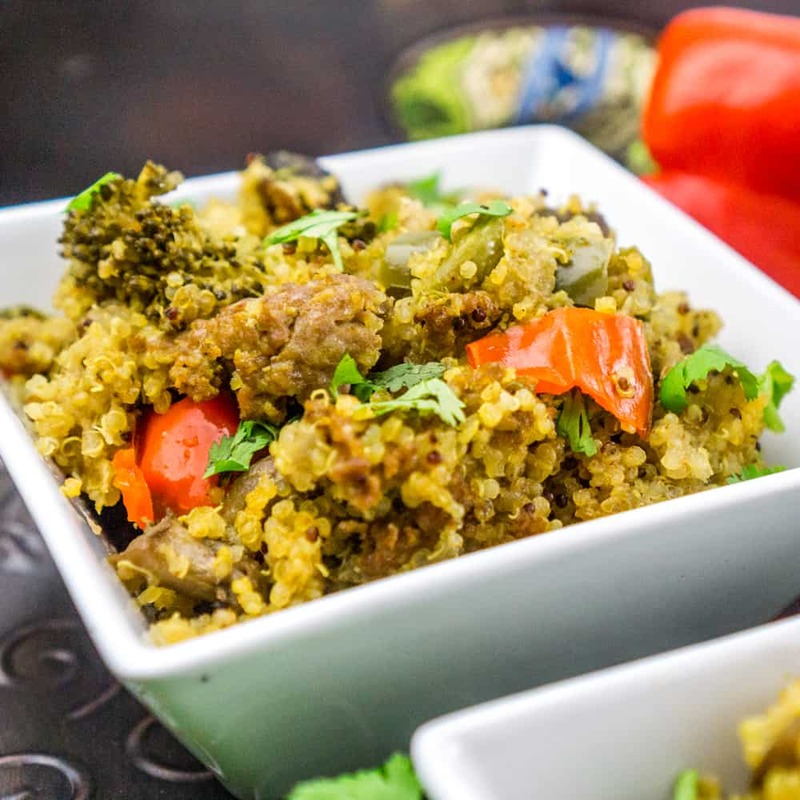 Wonderful recipe, another great way to use quinoa!